I found this quote recently whilst reading a film critics blog, and the idea stuck with me. The post went on to explain that some film makers recently, especially in the comedy sphere, have tried to make films that are deliberately ‘so bad it’s good’ goofy, or peppered with pop culture references, in an attempt to make a cult classic (think The Rocky Horror Show.) The problem is, this films often end up feeling flat or forced. I feel that the same applies to online viral videos, especially in the world of advertising. Any advertiser would love to have their work go viral, but it’s not a predictable or guarantee-able event. You can study ‘Charlie bit my finger‘ or ‘Friday‘ or ‘Numa Numa guy‘, or look at the demographics, the commenters, the imitations (or even make an response of your own – EE has a great ‘sequel to Numa Numa’ that I saw in the cinema last week and it’s pretty awesome, although I feel the older members of the audience didn’t get the joke) but you can’t really purposefully make a video with these features and expect it to ‘go viral’ and possibly more if you are advertising something. Online video gives opportunities for great, original and unusual advertising campaigns but in the end they work like any other traditional campaign, through message and exposure. If anything, an attempt to create a spreadable video might backfire badly for a company, much like the films described in that blogpost. That’s not to say that advertising campaigns and videos don’t go viral on YouTube or elsewhere, they frequently do. But it’s not something you can plan for or rely on. In this, Henry Jenkins points out that media doesn’t magically spread and share all by itself – there’s an audience involved who need to be appealed to in some way. In my last spreadable media post, I realised that I discussed the specific peaks in popularity of this video, and what was causing them, but I did not talk about the spread of views in between. Many of these came from the YouTube search page. I had made sure to try and tag my video appropriately. My friend and coursemate Nabeel Malik posted a video for his project which is in some ways similar to mine… well, it’s musical anyway, and he discussed in this post how proper tagging makes it easier for your video to spread, and be found by people who really want to watch it. On YouTube, post tags are private since people began abusing them by copying the tags of popular videos, but they still play a big part in gaining views even on videos such as mine, which aren’t hugely popular. Note the low view spikes between the large spikes where the video was posted to other sites. The sudden peak at the end is due to reposting the video on Reddit two days ago. It remains to be seen how soon that will drop off. It almost certainly won’t continue to rise, based on previous trends from both this video and the audio-only version on Soundcloud, which currently racks up one or two hits every few days currently, mostly from the UK, and mostly, I suspect, from my parents, though it did receive a few extra plays and some kind comments after being posted in a request thread on 4Chan. In addition, another Social Tech student, Greg Jackson has had a similar experience posting his music to various sites. On YouTube, the Analytics page can give you a ridiculous amount of detail about specific demographics, views and trends, but one of the more interesting searches is popularity by country. Since the song is used for the basis of this video is by an American band who were very popular in the UK some years ago, so unsurprisingly they are the countries providing the most views. However the next most popular country listed is Brazil. I decided to compare the analytics of the video to those on Google Trends, which looks at how search terms are trending worldwide. Unsurprisingly, ‘Wherever You Will Go The Calling’ as a search term is trending very highly in Brazil at present. I decided to do some more research regarding the band’s current activities if any, and it appears that the lead singer of The Calling has done a lot of work in Brazil. From Google Trends – Highest trending countries for the search term in the past 12 months (the short time scale which the site could provide. 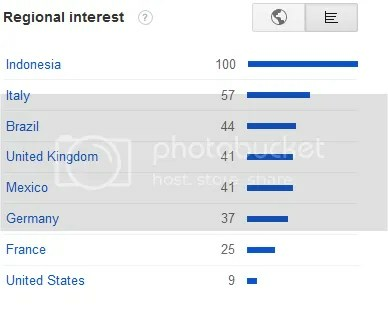 Note the UK, Brazil and the US are quite high, which matches the YouTube statistics.